Posts, Telecommunications and Information Technology Minister Mustafa Jabbar speaks at a press conference organised for launching of Huawei’s ‘Seeds for the Future’ campaign at a hotel in the capital on Sunday. Government plans to launch fifth generation (5G) mobile services by next year which will enable users to experience the fastest mobile connectivity, said Telecommunication Minister Mustafa Jabbar. 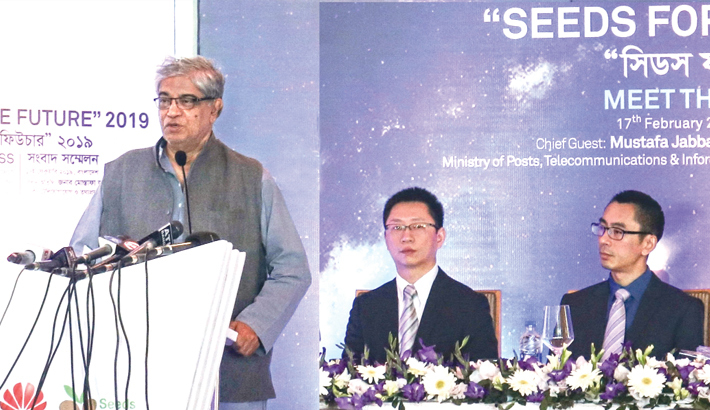 “The new generation technology will increase productivity as well as improve the lifestyle,” said the minister while addressing a function in the capital on Sunday. Chinese telecom giant Huawei announced the national launching of global flagship programme of ‘Seeds for the future’ where university students will project their innovations. The organisers informed that there will be ten selected students through activation programme at university level who will experience technology and training in the headquarters of Huawei in China. Mustafa further mentioned that the fifth generation network will transmit 20 gigabyte data per second which is now a dream for us. Bangladesh made demonstration of fifth generation (5G) mobile internet which was the first test run in South Asia in July last year. Earlier in February, the country experienced fourth-generation (4G) mobile internet services receiving high speed in mobile connectivity. Appreciating the young innovators, Mustafa further said the young generation is an asset for the country, they make us proud through positive contribution in society utilizing the technology. Huawei Technologies Bangladesh Chief Executive Zhang Zhengjun said, ‘We initiate the ICT talent hunt programme to help youth to engage in new innovations to make this society fully connected and intelligent’. Seeds for the Future, commenced in Bangladesh in 2014, implemented in 108 countries and international organization worldwide, benefiting over 30,000 students from 350 universities; among them, more than 3,600 university students have taken a study trip to the Huawei headquarters.